OLD SAYBROOK — The Estuary Council of Seniors, 220 Main Street, Old Saybrook announces a new and exciting program, “Lunch with Pat” featuring special guests. “Lunch with Pat” begins at noon. Lunch reservations are required by calling the Estuary Council at 860-388-1611 x216 no later than 11 am the day before the event. On Monday July 31, Scot Haney will be the Estuary’s special guest and speaker. Haney is WFSB Channel 3 Meteorologist, Journalist, and Co-Host of “Better CT.” An Ice Cream Social with Scot will conclude the program. This event is hosted and coordinated by Estuary Board Member Patricia Schneider. The program is open to the public. The building is handicapped accessible. Rep. Bob Siegrist testifies during a Public Hearing. AREAWIDE — On Tuesday, May 30, State Representative Robert Siegrist, who represents the communities of Chester, Deep River, Essex and Haddam supported legislation to promote real progress for education mandate relief. The proposal, HB 7276, An Act Concerning Education Mandate Relief, includes recommendations from concerned superintendents, administrators, teachers, Board of Education members, parents, and advocates. School districts and town officials from across the state have been strongly urging members of the legislature to provide mandate relief. 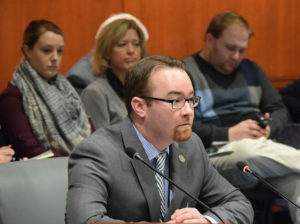 The bill is supported by Connecticut Council of Small Towns (COST) and passed out of the House of Representatives; it now heads to the Senate. The 2017 legislative session adjourns on June 7. AREAWIDE — SummerSing “Bill of Rights” by Neely Bruce on Monday, June 26, 7 p.m. at St. Paul Lutheran Church, 56 Great Hammock Road, Old Saybrook. This session will be conducted by Neely Bruce of Wesleyan University . All singers are welcome to perform in this read-through of a great choral work. The event is co-sponsored by Cappella Cantorum and Con Brio. Scores will be available, a $10 fee covers the costs of the event. The church is air-conditioned and handicapped accessible. Essex’s Memorial Day Parade has been cancelled due to the inclement weather. According to the Town’s website, ceremonies will now be held at Essex Town Hall at 9:30 a.m. and at the Essex Veteran’s Memorial Hall at 11 a.m.
AREAWIDE — There’s trouble in River City when a fast-talking salesman has his heart stolen by the town librarian! This musical with a lush score is a treat for the entire family. 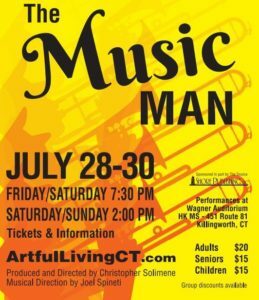 Played by a full professional orchestra and including unforgettable songs such as “Till There Was You,” “Shipoopi,” and “Seventy-six Trombones,” The Music Man offers a night to remember. See this show and, at the same time, support community theater. More than 100 residents from across the shoreline and up the Connecticut River star in this toe-tapping adventure with fast-talking salesman Professor Harold Hill, who convinces the townspeople of River City, Iowa that they need a band, instruments and uniforms. But Harold is no musician. He plans to skip town with their money but his scheme comes to a crashing halt when he falls in love and suddenly has to face the music. Sponsored in part by Shore Publishing, the show is directed by Chris Solimene with musical direction by Joel Spineti and choreography by Paola Rarick. ESSEX — Memorial Day offers an opportunity to reflect on our freedoms and honor those that have given their lives in defending those freedoms. In recognition of these fallen heroes, the Essex Memorial Day Parade will provide a reverent celebration winding through the streets of Essex. The parade will commence on Memorial Day, May 29, at 9 a.m.
All veterans are welcome; wear your uniform of choice or collared shirt/slacks and join your fellow warriors. Assemble at the Foot of Main Street in downtown Essex at 8:45 a.m. If weather precludes a parade, ceremonies will be held at Essex Town Hall at 9:30 a.m. and at the Essex Veteran’s Memorial Hall at 11 a.m. All interested parties please contact Alex Breen, Jr., at 609.805.7146 or email huntnfreak@icloud.com with questions. Veterans who may require transportation are requested to contact the above. It’s ‘First Friday’ Next Friday in Chester, June 1! ‘Around the Mark’ by Vanessa Piche. The opening for her solo show, ‘Summer Tides’ is on First Friday, June 2, in Maple and Main’s Stone Gallery. CHESTER – Live music, homemade vin d’orange, a revamped store and restaurant, pottery show, new jewelry collections, sale on spring and summer scarves, cosmopolitans, wine tastings, French Fizz cocktails and art openings are all part of First Friday, June 2, from 5 to 8 p.m.
Homemade vin d’orange and orange-thyme cookies are being offered at the Perfect Pear while the former Elle Design, now Harvest Moon, will reveal its newly renovated space with a mixed media art opening, live music and wine tasting. There are changes at Good Elephant, too, which has moved upstairs under new ownership while L&E has returned to the downstairs space and is celebrating by serving First Friday French Fizz cocktails. Complimentary bar snacks at the bar from 5 to 6:30. The opening reception for a solo show of oil paintings of New England scenes by Rhode Island artist Vanessa Piche is being featured in Maple and Main’s Stone Gallery from 5:30 to 8 p.m. There will be wine and food. 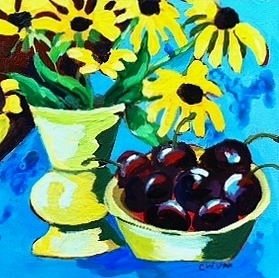 View the Spring exhibit and “Little Gems’ show of 8×8 paintings. At Leif Nilsson Spring Street Gallery, listen to Arrowhead play and view the Nilsson & Newton show which closes after this weekend. A “Dive into Summer” party is taking place at French Hen with the launching of a jewelry line from Spain, 10 percent off all Simon Pearce pieces and the serving of mini sparkling cosmopolitans. Lark is offering spring/summer scarves for $15 each and serving drinks and “something tasty” while BlackKat Leather is featuring a display of pottery by Julie Bonilla of Studio B Pottery in Haddam and serving wine. Favorite rose wines will be served in a wine tasting from 5 to 7 p.m. at the Chester Package store. Dina Varano collects beach and river stones to incorporate into her jewelry – her newest collection will be unveiled First Friday; wine will be served. If you are a member of the Chester Historical Society or join by Friday evening, you are invited the society’s opening reception from 5:30 to 7:30 p.m. at the Chester Museum at the Mill.. Enjoy the Society’s summer-long exhibit: “Postcards and Three Notables.” Food and drink and a 10 percent discount in the gift shop are being offered. CHESTER — Chester’s 27th Annual Townwide Tag Sale takes place today, Saturday, May 27– sales open at 8 a.m. and end by 3 p.m.(or earlier). The event is rain or shine. You’ll find well over 50 tag sales throughout the entire town of Chester, in residences and businesses. As you enter town, you will see friendly volunteers selling maps (a $1) that will give you the locations of everyone hosting a tag sale. Spend more time with the maps and less time trying to find the sales by randomly driving around– although, that is fun, too. Make a day of it and enjoy all that the Town of Chester has to offer. When you are ready to take a break, restaurants will welcome you with coffee, fresh baked treats, and great food any time of day. The downtown merchants – some of them new like Black Leather, The French Hen, Strut the Mutt and The Perfect Pear – will welcome you with open arms, with shelves stocked with specials, and galleries filled with unique objects of desire. Don’t forget to pick up a loaf or two of Simon’s well-known bread. ‘Ready to Bargain in Southern France’ by BL Taylor of Essex is one of the paintings included in the Unframed Art Show at Maple & Main Gallery today. A one-day show of unframed, original art by Maple and Main artists will be held today in conjunction with the Townwide Tag Sale when over 150 works on paper, board and canvas will be offered from 9 a.m. to 7 p.m. 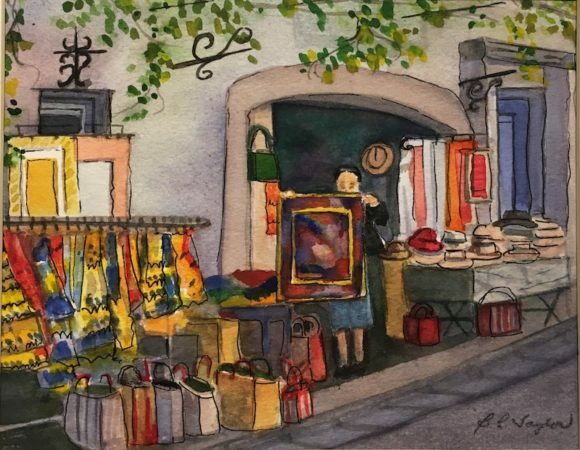 The show will be under a tent at the gallery entrance and on the porch and offers visitors a chance to buy paintings for less and choose their own frames to complement their homes. Visit Mapleandmaingallery.com to view a selection of works in the show. The downtown area is revitalized – check out the new bridge (or bridgework) and sidewalks. If you want to learn about the town, walk into the Chester Historical Society’s Museum at the Mill in the center of town where you can learn about the Life and Industry along the Pattaconk. Walk up to the Chester Meeting House or simply stroll about and enjoy the day. 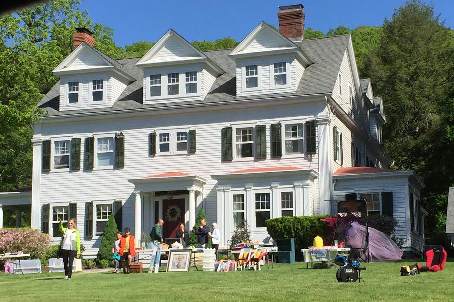 The first such event of its kind in the Lower Connecticut River Valley, the Chester Townwide Tag Sale was started by a group of Chester merchants in the mid-90’s and was run by the Merchants Group for several years. In 2003, the Chester Historical Society took over the event and ran it for the next seven years. The event is now organized by Chester Republican Town Committee, who have been running it for the past five years. Proceeds from listing fees, map sales, and advertising on the map are used to promote the event throughout Connecticut. Net proceeds from this event benefit the Chester Republican Town Committee’s general fund. If you have questions or require more information, email kris.seifert@gmail.com or phone 860-526-8440 / 714-878-9658. For more information, contact Kris Seifert at (860) 526-8440 or kris.seifert@gmail.com. 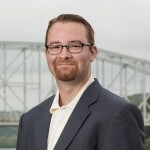 AREAWIDE — On Wednesday, May 16, State Representative Robert Siegrist applauded the passage of House Bill 6334, which passed unanimously. The bill aims to improve conditions at brick and mortar private, non-profit animal shelters by requiring them to register with the Department of Agriculture (DoAg) and to comply with local zoning requirements. Under the bill, DoAg must issue a registration to an applicant upon application and payment of a $50 fee if the applicant complies with applicable state regulations and, for an initial registration, municipal zoning requirements. A registration is effective until the second Dec. 31 following issuance, may be renewed biennially by Dec. 31, and may be transferred to another premise with the commissioner’s approval. The bill authorizes the commissioner, or his agent, to inspect an animal shelter at any time. If, in his judgement, the shelter is not being maintained in a sanitary and humane manner that protects public safety, or if he finds that contagious, infectious, or communicable disease or other unsatisfactory conditions exist, he may fine the shelter up to $500 for each affected animal, issue orders necessary to correct the conditions, and quarantine the premises and animals. In addition, if a shelter fails to comply with the commissioner’s regulations or orders or any state law relating to animals, the commissioner may revoke or suspend its registration. Anyone aggrieved by a commissioner’s order may appeal to Superior Court. Anyone operating a shelter without a valid registration is subject to a fine of up to $200. This bill is supported by CT Votes for animals, ASPCA, the US and CT Humane Societies and Our Companions Animal Rescue. House Bill 6334 now heads to the Senate, where it will need to be voted on by midnight on June 7. 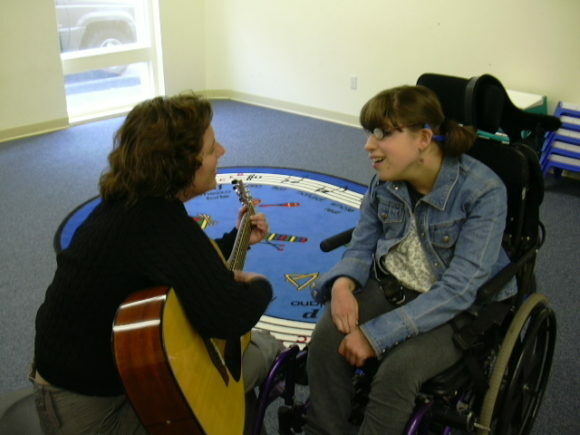 CENTERBROOK — Community Music School is offering new music therapy programs this summer. In addition to one-on-one music therapist sessions, CMS is debuting three new group classes beginning in June led by board certified music therapist, Amy Hemenway. Music Therapy Group Class for Young Children with Autism begins June 28 at 10am for ages 2-5. This group will consist of 6, 30-minute group sessions to target various skills including communication, joint attention, gross/fine motor skills, socialization and other sensory-related needs. The final 15 minutes of each session will be reserved for parent/guardian feedback and questions with the therapist. Music Therapy Social Skills Group for Adolescents & Young Adults with Autism begins June 28 at 5:30pm for ages 13-22. This group will consist of 6, 45-minute group sessions for individuals ages 13-21 that have high-functioning autism. The final 15 minutes of each session will be reserved for parent/guardian feedback and questions with the therapist. Group endeavors will involve lyrical analysis, songwriting and improvisation activities designed to promote self-expression, creative/musical expression, communication of thoughts/ideas, group collaboration and peer support. Music Therapy Drum Circles are scheduled for July 14 and August 11 at 7pm. This family-oriented event will promote socialization and creative/musical expression. Individuals of all ages and abilities may participate. Not restricted to music therapy students! Amy Hemenway is a board-certified music therapist who enjoys providing clinical services to children, adolescents and adults on the autism spectrum. She also has experience in working with individuals with a variety of cognitive, psychological and motor impairments. She received her Bachelor of Music degree from Marywood University, Scranton, PA in 1998 and recently received her Master of Arts in Music Therapy degree from Saint Mary-of-the-Woods College, Terre Haute, IN. For additional information, visit www.community-music-school.org/therapy or call CMS at 860-767-0026. Abby’s Place Restaurant, Acer Gardens, Aegean Treasures, Ashleigh’s Garden, Bartlett Tree Experts, Black Seal, Blue Hound Cookery, Connecticut River Publishing Co., Copper Beech Inn, Cortland Park Cashmere, Ron Cozzolino, De Paula Jewelers, Dough on Main, Essex Olive Oil Company, Essex Winter Series, Goodspeed Musicals, Haystacks, Ivoryton Playhouse, Marily MacKinnon Interior Design, Wendy and John Madsen, Charlotte Meyer Design, Musical Masterworks, New Earth Acupuncture, One N Main, Jeanette Pollard, Pough Interiors, Patricia Spratt for the Home, 1738 Farm, That’s the Spirit Shoppe, The Valley Railroad Company, Weekend Kitchen, and Weltner’s Antiques and Art. Dave Courcy, Commodore of the Pettipaug Yacht Club, at the club’s docks. ESSEX — The Pettipaug Yacht Club held its formal commissioning ceremonies to mark the opening of the 2017 sailing season on Sunday, May 21. The ceremonies were held on the club’s grounds, which are located on the western bank of the Connecticut River in Essex. 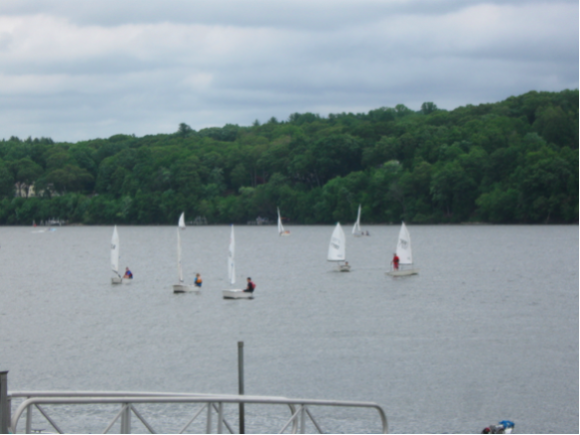 Prior to the formal opening of the club’s season, there was a dinghy sailing race at 1 p.m. by club members. The entrance sign to the Pettipaug Yacht Club welcomes members, guests and PSA students. All of the 300 plus members of the Pettipaug Yacht Club were invited be attend the formal commissioning ceremonies of the 2017 sailing season held on May 21 at the club’s headquarters on the Connecticut River. Pettipaug YC sailors will be soon be out again on the waters of the Connecticut River. The ceremonies were conducted by the Club’s Commodore Dave Courcy and Vice Commodore Katheren Ryan. Commodore Courcy has served in that position from 2016 to the present. Prior to that he served as the Vice Commodore and Rear Commodore. 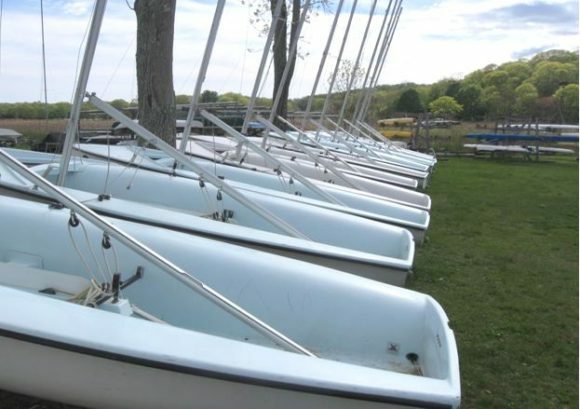 Sailing dinghies mostly used by younger sailors at the Pettipaug Yacht Club. 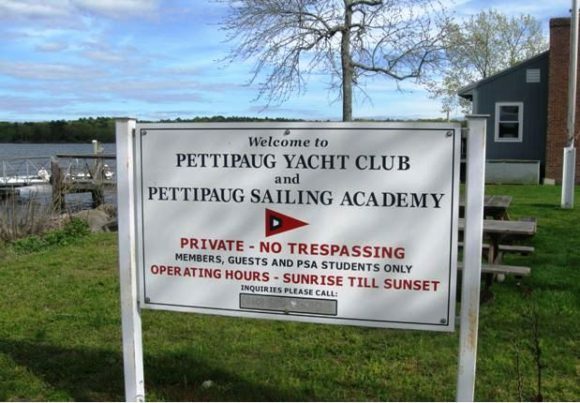 In addition to being available for the general use of club members, Pettipaug Yacht Club also sponsors the Pettipaug Sailing Academy (PSA) during the summer months, at which young sailors are taught to sail. The club also sponsors power boat instruction conducted by club member John Kennedy. If interested in joining the power boat classes or for further information, contact Kennedy at Kdesign@snet.net. Club membership is not required in order to attend the power boat classes. AREAWIDE — The Estuary Senior Center provides transportation to those aged 60 and over for medical appointments, including dialysis, to any medical location beyond the nine-town estuary region such as Branford, New Haven, Middletown, Hartford and New London. With the Center’s Stan Greimann EMOTS program, a driver and car will pick you up, take you to your appointment, and bring you back home. For more information on the Stan Greimann EMOTS program, call David at 860-388-1611, X203. Suggested donation of $35 for roundtrip service. July 5: Wiggle Bots @ 5:30 p.m.
July 6: Picnic Story Time @ 11 a.m.
Bring a lunch and hear some stories! In the Children’s Garden if the weather permits. July 6: Get Growing with Seed Bombs @ 3 p.m.
July 7: Yoga for Youngsters @ 10:30 a.m.
Join us for a special story walk yoga with Jen from Earth Friends Discovery. Perfect for the preschool set. Bring a mat or towel. Open to all, space providing. July 12: Magic of Christopher @ 5:30 p.m.
Light comedy fuses with the mystery of magic as Christopher Hurlbert performs. This program is perfect for all ages and is free and open to all. No registration is required. July 13: Picnic Story Time @ 11 a.m.
Bring a lunch and hear some stories! In the Children’s Garden if the weather permits.July 14: Pequot Sepos Nature Center @ 10:30 am. A live animal program that is perfect for the preschool set. Friday, July 14: Denison Pequotsepos Nature Center @ 10:30 a.m.
July 19: Riverside Reptiles visits @ 5:30 p.m.
Get ready to encounter some creepy creatures when Riverside Reptiles visits with their ‘Jeepers Creepers’ show! We will get hands on with a variety of reptiles, amphibians, arachnids and insects. This is an interactive program with live animals that is suitable for all ages. Free and open to all, no registration required. July 20: Picnic Story Time @ 11 a.m.
July 21: Mr. Gym will be rocking the library @10:30 a.m. This is an interactive musical show best suited for preschool – grade 2. July 26: Cedar Island Touch Tanks @ 5:30 p.m.
Let’s go for a journey under the sea when the Cedar Island Touch Tanks visits. Learn about the history of Long Island Sound and get hands-on with some of our native sea creatures that inhabit the water. This is an interactive program with live animals that is perfect for all ages and is free and open to all. No registration is required; just bring your interest in sea life. July 27: Picnic Story Time @ 11 a.m.
July 28: Baseball Story Time with Miss Elaine @ 10:30 a.m.
Join this special baseball-themed story time followed by an ice cream social to wrap up the library’s summer programming. A Yard Goats mascot has been invited to pop in for pictures. No registration is required. All are welcome. Programs are sponsored by the Friends of the Deep River Public Library. For more information, visit http://deepriverlibrary.accountsupport.com and click on our monthly calendar. Summer service hours are: Monday 1 – 8pm; Tuesday 10 am – 6 pm; Wednesday 12:30 – 8 pm; Thursday and Friday 10 am – 6 pm; and Saturday 10 am – 5 pm. *July and August, Saturday 10-am – 2pm. ESSEX — The Friends of Essex Library host their Annual Spring Book Sale on Saturday, May 20, and Monday, May 22. Doors will open Saturday at 9 a.m.
Hardcovers are priced at $2; paperbacks at $1. From 3 to 4 p.m. books will sell for half price. “Fill your Bag for $5” will run from 4 to 5 p.m. for all books except those specially priced. You are invited to bring your own tote or paper bag. Free paper bags will be available at the library. The “Fill your Bag for $5” sale will continue on Monday, May 22 from 10 a.m. to 6 p.m. Unique to this sale is a collection of 30 Life magazines from the 1930’s and 40’s, featuring everyone from Winston Churchill to Roy Rogers and Trigger. Each is in a plastic sheet protector and priced between$3 -$5. Also available for sale will be a jazz aficionado’s collection of 150 CDs, from Diana Krall and Hoagy Carmichael to Starbucks and Pottery Barn choices, each for $1.00. interest, can be viewed on the Essex Library website.Click HERE for more information.In addition to the books for purchase, there will be a large number of board games from which to choose. 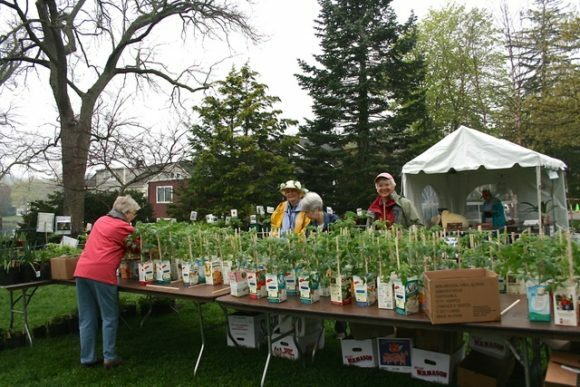 The Ivoryton Library annual Book, Bake & Plant Sale will be held on Saturday, May 20 from 9 a.m.to 1 p.m. There will be perennials from members’ gardens, homemade baked goods and the big used book sale. Baked goods can be dropped off on Saturday morning. New this year: Buy an Ivoryton Library Book Bag for $15 and fill it with used books from the sale for free. Bring it back to the sale next year and fill it for $5.00! This sale is a great time to stock up on summer reading for all ages as well as goodies for your kitchen and garden. Support from those who make donations and/or attend the sale is much appreciated. For more information, call the library at 867-767-1252. The Ivoryton Library is located at 106 Main St in Ivoryton. Watching for birds on an Essex Land Trust hike. ESSEX — May is the optimal time to see and hear the many birds that have returned from wintering in points south. Many will be singing and claiming nesting territories. Come explore the grounds of Essex Meadows. 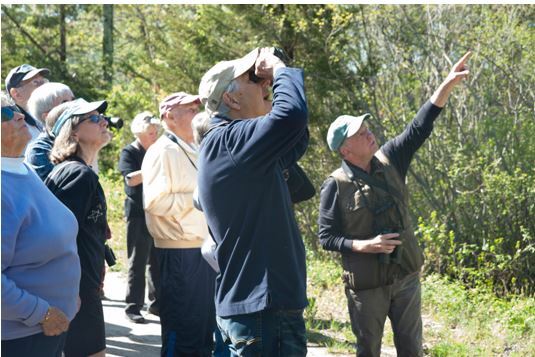 Essex Land Trust Board Member and birder Jim Denham will lead a casual 1 1/2 hour stroll that coincides with the peak of spring bird migration. All levels of knowledge are welcome. Essex Meadows will provide refreshments at the conclusion of the walk. Easy to moderate walking on trails. Bad weather cancels. The event takes place Saturday, May 20, 10 am. Meet at Essex Meadows Main Building Entrance. 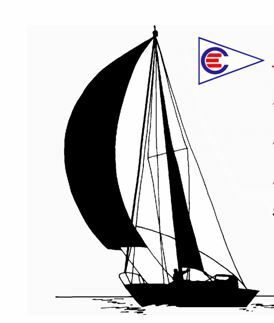 ESSEX — Continuing its tradition of supporting charitable events, the Essex Corinthian Yacht Club (ECYC) will host its Annual Spring Party to Benefit the Leukemia & Lymphoma Society on Saturday, May 20, starting at 6: 30 p.m. at the club on Novelty Lane in Essex. What is better than to enjoy entertainment in a beautiful location overlooking the Connecticut River and do something for a good cause at the same time? The event is supported by members of the Essex Corinthian Yacht Club, in cooperation with the Duck Island and North Cove Yacht Clubs. The Arrowhead String Band from Chester, with renowned local artist Leif Nilsson, has graciously donated their performance at this event to this worthy cause. There will also be a raffle and silent auction, and a few more surprises! All proceeds will benefit the lifesaving work of the Leukemia & Lymphoma Society. For further information, call Jean Little, Office Manager, ECYC at 860-767-3239. The ECYC is located at 9 Novelty Lane, PO Box 759, Essex CT 06426. AREAWIDE — The Shoreline Soup Kitchens & Pantries (SSKP) new Westbrook meal site is open for dinner from 6 to 7 p.m. every Friday. 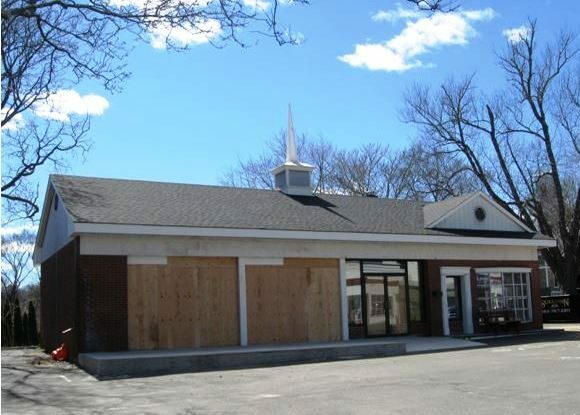 The site is located at the Westbrook Congregational Church, 1166 Boston Post Road. All are welcome to attend. Did you know that last year over 900,000 meals worth of food were distributed to individuals and families during The Shoreline Soup Kitchens & Pantries grocery distribution program? And, that over 17,000 nutritious and delicious meals were provided at our 9 meal sites, serving seven days a week? There are those among us who are hungry and alone. You can change that; you can make a difference in the lives of those who are hungry in body and spirit. Contact SSKP to learn about the many opportunities to volunteer. The SSKP offers food and fellowship to the communities of Chester, Clinton, Deep River, East Lyme, Essex, Killingworth, Lyme, Madison, Old Lyme, Old Saybrook and Westbrook. The SSKP’s family-oriented meal sites serving nutritious and delicious food are located in Centerbrook, Chester, Clinton, Deep River, Essex, Old Lyme, Westbrook and Old Saybrook. And, SSKP food pantries are located in Clinton, Old Lyme, Old Saybrook, East Lyme and Westbrook. Also, provided to those who have limited cooking facilities are heat-n- meals that can be picked up at any of our pantries. Community support of the SSKP is appreciated. If you have any questions or for a more information, call 860.388.1988 or email at pdowling@shorelinesoupkitchens.org. DEEP RIVER — The Deep River Public Library will be introducing Wandoo Reader, an interactive program to log summer reading. Interested participants can access Wandoo Reader from the library’s home page. There will be a two registration options, one for adults and the other for children. Registration begins June 14. Logging begins on June 28. Participants can sign up by choosing the “join here” tab and filling in the appropriate information, including choosing a user name and password to access their account. Kids under age 18 will be eligible for prizes and weekly raffles, which include novelties, snacks, craft kits, Avery’s Gross Soda, gift certificates for scoops from the Sweet Shoppe, and cookies at Dough on Main. We will also raffle off an Erector set and a gift certificate to Deep River Pizza. Wandoo Reader for Kids has a fun interface to help encourage children to complete the Governor’s Reading Challenge. As they log books, participants earn points to modify their adventure character. Wandoo Reader makes it easy for students to keep track of their books. No more lost paper logs – simply print your list of books at summer’s end! Parents and Adults can enjoy a simpler version of Wandoo Reader. Register and log your reading with Wandoo Reader Adult and become eligible for the end-of-summer raffle, which include gift certificates to local Deep River merchants. Summer Reading programs are free and open to all. Programs are sponsored by the Friends of the Deep River Public Library, Dough on Main, Deep River Pizza, the Sweet Shoppe and the Hartford Yardgoats. For more information, visiy http://deepriverlibrary.accountsupport.com and click on our monthly calendar, email the Children’s Department at drplchildrensdept@gmail.com or call the library at 860-526-6039 during service hours: Monday 1 – 8pm; Tuesday 10 am – 6 pm; Wednesday 12:30 – 8 pm; Thursday and Friday 10 am – 6 pm; and Saturday 10 am – 5 pm. Broadway Bound with the Community Music School. At the School’s Centerbrook location, private lessons, group classes and ensembles are available including Tutti Flutie Flute Ensemble with Cheryl Six; Beginning Group Piano with Tom Briggs; CMS Drum Village with Marty Wirt; Introduction to Music Technology with Tom Briggs; Jazz for the Beginning Student with Tom Briggs; Drums & Percussion Workshop with Tom Briggs; the Science of Sound with Christine Coyle; and Summer Kindermusik Drop-in Classes with Martha Herrle. Community Music School’s eight-week summer session of private lessons runs from June 26th through August 18th and registrations are accepted throughout the summer. Summer lessons can be scheduled around family vacations at your convenience, and a four-pack of lessons is offered at reduced rate. For additional information, visit www.community-music-school.org/summer or call CMS at 860-767-0026. CHESTER — Leif Nilsson Spring Street Studio and Gallery at One Spring Street, Chester, presents Nilsson & Newton, a special exhibit of paintings by Leif Nilsson and sculptures by Richard Newton. Nilsson works with oil paint on canvas and Newton works with shaped and painted steel. The exhibit will be open from noon to 6 p.m. on Saturdays and Sundays and other times by appointment through June 4, 2017. HARTFORD — State Representatives Jesse MacLachlan (R-35th) and Devin Carney (R-23rd) joined their House Republican colleagues May 16 to issue their revised no-tax-increase budget for 2018-19 that eliminates the projected $5 billion budget deficit, increases school funding for all towns, reduces the corporate surcharge and mitigates municipal aid losses by reallocating funds. “Connecticut cannot afford another budget that raises taxes on the middle class or burdens our small towns. I am proud of the budget that my Republican colleagues and I have put forth as it does not rely on tax hikes or passing huge costs, such as teacher’s retirement, onto municipalities. I am hopeful that Republicans and Democrats in the legislature can work together to restore the fiscal health of Connecticut by passing a common sense budget that will allow our state and its residents to thrive,” said Rep. Carney. In this current proposal, Republicans revert back to the former Education Cost Sharing formula, while also adding $20 million to the distribution. In addition, the proposal establishes a $90 million grant in order to ensure that no municipality loses aid compared to the current fiscal year. Republicans now join Democrats and Gov. Malloy at the negotiating table to come up with a final budget plan that can pass both the House and Senate. For more information on the House Republican budget proposal, visit www.cthousegop.com/budget. 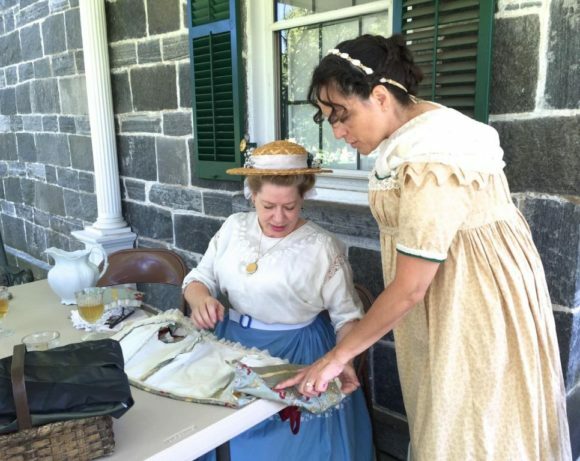 The Ladies Historic Sewing Circle demonstrate their craft. DEEP RIVER — The Deep River Historical Society will be hosting the Ladies Historic Sewing circle for a second year in a row. The event will take place Sunday, July 16 from 2 to 4 p.m. and is held at the Stone House, 245 Main Street, Deep River. The Ladies Historic Sewing Circle gather for a photo on the steps of the Stone House. The Stone House will be open for self-tours on the same day for those interested in visiting the inside of the 1840 homestead that is considered by many to be the Jewel of Main Street. 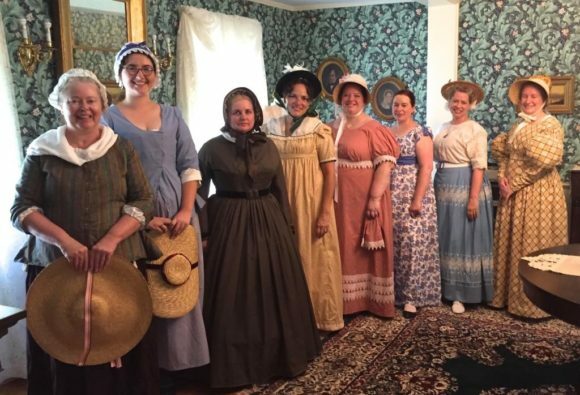 The Ladies Historic Sewing Circle gather for a photo inside the Stone House. Come a spend a little time looking back in history and seeing the lost art of sewing and exhibits that are in the house. 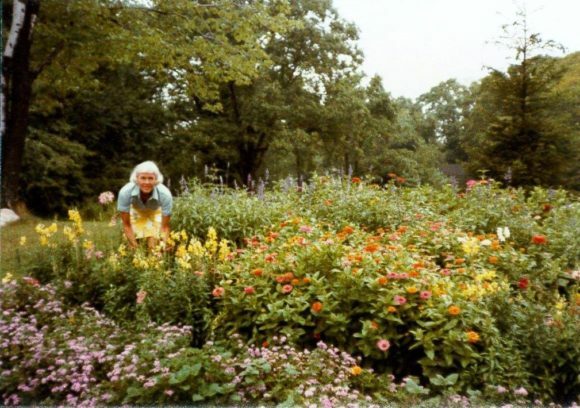 In this submitted photo, the late Tillie Colihan is seen tending her flowers. Avid gardener, conservationist, seeker of solutions to make the world and our local communities better places, Tillie Colihan died peacefully in her Essex Meadows home on May 2, 2017. Born May 20, 1920 in Mount Vernon, NY to William and Rowena Alston, Tillie attended Madeira School in Greenway, VA, and graduated from Pine Manor College, Chestnut Hill, MA in 1940. She made lasting friendships with classmates and served as alumnae secretary for both schools. Following the war, she became a receptionist at the Young & Rubicam advertising agency in New York City. There, she met William J. Colihan, whom she married in May 1948. Tillie and Bill settled in Greenwich, CT, where they raised four children, Alston Colihan of Washington, D.C., Jane Colihan of Brooklyn, NY, William Colihan of New York, NY, and Abby Colihan of Montpelier, VT. During these years, Tillie took up yoga and developed an interest in natural foods and alternative medicine. In 1980, Tillie and Bill moved to a house – designed by Bill and her brother, Henry Alston – on the Connecticut River in Essex. Tillie spent springs and summers in her field, surrounded by bluebirds and wildflowers. She enthusiastically organized the making of trough gardens for May Markets. Wanting to share nature’s beauty, Tillie regularly brought flowers from her garden to the Essex Meadows Medical Center – a practice she kept up for many years. During the winters she and her husband traveled in the U.S. and internationally. Bill died at Essex Meadows Medical Center in July 1994. In 1998, Tillie moved to an apartment in Essex Meadows. Hours that she had spent in her garden she now spent feeding birds and keeping up with all things happening in the world. In recent years she has enjoyed watching her four rarely-disciplined grandchildren, Dan, Jim, Dana, and Molly, turn out fine. As she wished, there will be a small memorial service later this summer. I love libraries. I visit different ones weekly. But I have concerns about whether or not an 8,000 square foot, $7.4 million library (excluding bonding costs), can be sustained by Chester’s taxpayers, or utilized enough by Chester’s population to warrant a building of this magnitude. There’s been much discussion about developing North Quarter Park. But until the Board of Finance and taxpayers vote on it, it’s not a done deal although a lot of time, money and hard work have gone into creating these plans. Perhaps there are more cost effective options to keep taxes down so young families can afford to move here, and older families can afford to stay. Perhaps we build a smaller library. The state recommendation is 1.6 square feet per person. With a population of 4,245, and approximately 1,041 cardholders, does 6,720 square feet or smaller make sense? Certainly, it would cost less to build, staff and maintain. Libraries are also going digital and ultimately will require less space to house collections. Should this be considered when deciding on how much square footage is need? We also have 6 neighboring libraries offering programs and events all within a 12-minute drive or less that can easily be utilized. We, the taxpayers, should carefully consider what the size, scope and cost of this project should be, and what we as a town, really need. Rendering of the proposed waterfront premises by Centerbrook Architects. ESSEX — Essex Boat Works, LLC and Carlson Landing LLC presented their finalized building plans for its Main Street property for review by the Town of Essex Zoning Board on Monday, May 15. The details of the plans will begin with the construction of a new marina building and accessory waterfront restaurant with Main Street access. The business and property were purchased in February of 2016, by Richard (Rick) E. Carlson/Carlson Landing, LLC of Essex, Conn. Carlson purchased the property with the vision to preserve a very important piece of boating and Essex history while beautifying the waterfront area and supporting the economic business development goals of the town. A team of expert consultants, Centerbrook Architects and Milone & MacBroom, have developed a proposal that complies with regulatory and code requirements. Centerbrook Architects has planned and designed a suitable year-round building to be used for office space, marina customers along with an accessory waterfront restaurant. The design goal was established to keep to the historical look and feel of the downtown Essex area, specifically the nearby buildings. 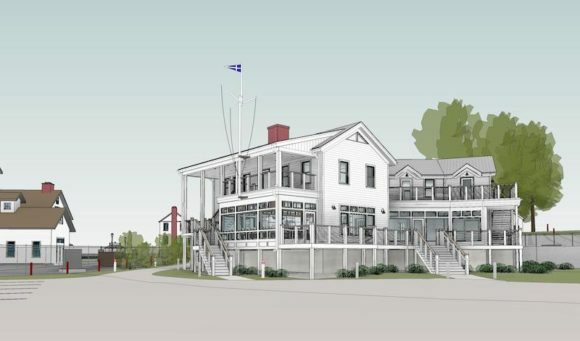 The new establishment, located on the Essex Harbor, will be an anchor for the town. It is a prime location for visitors from the water to dock their boats, visit the local restaurants and shops throughout Essex Village. The accessory restaurant will feature waterfront indoor and outdoor dining with a menu of ‘lite bites,’ small plates of upscale casual seafood selections. Editor’s Note: One of the oldest remaining shipyards in the country, the location of Essex Boat Works predates the War of 1812, where the building of the U.S. warships was performed. Located in the heart of the historic Essex Village, EBW continues the legacy of top-notch customer relations and professional services including; marina, storage, service, brokerage and new yacht sales. A new office, marina building with an accessory restaurant are planned for construction beginning in 2017. For more information visit: www.essexboatworks.com or call 860-767-8276. 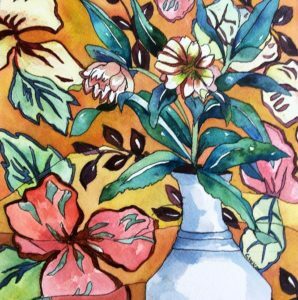 ‘Hellebore and backcloth’ by Claudia van Nes is featured in the ‘Little Gems’ show. CHESTER– Bring your mother to Maple and Main Gallery Sunday where she – and you – will be served mimosas, chocolate-covered strawberries and other chocolate treats from 11 a.m. to 3 p.m. The Little Gems show in the Stone Gallery on the lower level is filled with 8”x 8” paintings, all $200 and perfect for gifts as are the paintings in our Small Works Gallery on the main floor. There are also gift certificates and reasonably priced original, unframed works for sale. Or, maybe you’re a mom. If so, just come by and spend some quality time with art – you deserve it! The following op-ed was submitted by the Executive Director of the Connecticut River Museum, Christopher Dobbs. 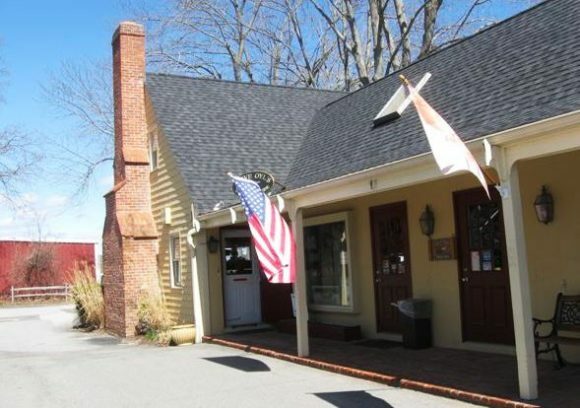 The Connecticut River Museum may be getting a new neighbor – a restaurant called Carlson’s Landing, to be located at 63 Main Street on a flag lot that bisects the Museum’s campus – the main Museum at 67 Main Street and the Lay House at 57 Main Street. The Museum is delighted Essex is getting a business that might draw welcome patronage to the Village’s main commercial district. However, the organization does have reservations about the application for the new restaurant which it will air at the upcoming Zoning Commission’s public hearing at 7:00 pm on May 15th . Careful review of the Carlson’s Landing application by engineers, a zoning specialist, and a surveyor have resulted in several concerns. The majority of these stem from inadequate information. Major concerns at this time are: 1) increased traffic congestion and impact; 2) inadequate parking; and 3) under equipped bathroom facilities and septic system. The proposed plan permanently removes the Museum’s stairway connecting the two halves of its campus. This staircase, in honor of Sherry and Herb Clark, was donated to the Museum in 2013 by the Rotary Club of Essex with the permission of the property’s previous owner. It has allowed the Museum to thrive and better serve the community. Removal will result in the two halves being disconnected and the Museum installing a new set of stairs to the Lay property from the village sidewalk. More importantly, thousands of program attendees, including school children, will need to walk along the road and cross the entrance of the restaurant. Increased traffic by cars and trucks, no matter where pedestrians cross to stroll down to the waterfront, will transform the foot of Main Street. For safety and aesthetic reasons, the Museum has suggested to the owners that commercial traffic enter and exit via 9 Ferry Street, which they have refused to do. The Museum has also requested that they limit traffic off of Main Street during major community events such as Burning of the Ships Day, the Annual Essex Shad Bake, Dogs on the Dock, and Trees in the Rigging. To date, the developers have not formally agreed. Parking on the restaurant lot (10 spaces are identified on the plan) is inadequate. To meet zoning regulations, the plans call for using the adjacent Essex Boat Works property for parking. Since the Boat Works will continue to operate as a boat yard and marina, the Museum is concerned that the operations will impinge on the theoretical parking spaces and that restaurant patrons will need to find parking elsewhere, including in the Museum’s lot. The Museum worries that if 63 Main Street and 9 Ferry Street were ever sold separately that the one-way driveway will need to become two-way (including commercial traffic) and there will then be even more inadequate parking on the restaurant lot with subsequent further strain on the Museum parking lot. One solution to this problem would be to secure cross-property easements (between 63 Main Street and 9 Ferry Street) for parking and ingress/egress that would survive any future sale of either lot. Finally, the Museum has concerns about the new restaurant’s septic system design and bathroom capacity. The application indicates that the system’s leaching fields will be located on the flag lot between the Museum’s two properties – uphill and very close to the line. Sewage will need to be pumped uphill to the leaching fields. The Museum’s engineer questions the fields’ ability to withstand inundation from rainfall, let alone over-use. There are only two restrooms shown on the plans for the new restaurant that are meant to accommodate 59 restaurant patrons. In addition to restaurant patrons, the restrooms and septic system will also need to accommodate restaurant and marina employees along with showers for marina customers. The Museum questions whether the new restaurant has made adequate provision and is concerned that its own restroom facilities (the two in the Lay house and the three in its main building) will have additional demand placed on them by people frequenting lower Main Street. The Museum is pleased to have a new neighbor on the foot of Main Street. Carefully addressing these concerns will allow the Museum, the restaurant, and our community to flourish. Editor’s Note: For 43 years, the Connecticut River Museum has been a significant community and regional asset. Over 25,000 visitors each year attend the Museum’s programs with many more using the front lawn and Lay house property as their park and access to New England’s great river. The Connecticut River Museum is located on the Essex waterfront at 67 Main Street and is open 10 am to 5 pm, closed Mondays until Memorial Day. The Museum, located in the historic Steamboat Dock building, offers exhibits and programs about the history and environment of the Connecticut River. For more information on the Museum, visit www.ctrivermuseum.org or call 860-767-8269. As part of the Essex Foundation’s gateway beautification project, Chanticleer pear trees were planted along Route 154 in Essex by a Sullivan Lawn Services installation crew. ESSEX – The Essex Foundation recently completed the first phase of a multi-phase landscape plan for the grounds surrounding the newly painted bridge in the Rte. 9/ Exit 3 underpass area of Essex. Twelve Chanticleer pear trees were planted on the state-owned land south of the Rte. 154 and Rte. 153 intersection, directly across from the Essex Fire Department station and commuter lot. The charitable organization contracted with Matthew Verry, a graduate of the University of Connecticut’s Landscape Architecture program, for the planning and coordination of the work. His company, Matthew Verry Landscape Design, provided the landscape design and oversight of the state approval and installation bid process. Sullivan Lawn Services, LLC was hired for the installation work. The Chanticleer pear tree was selected for its beauty and hardiness. It is one of the most profuse flowering trees with a narrow, tailored appearance. It tolerates many urban conditions, making it a popular street tree choice where spread may be a bit limited. The next phase of the landscape beautification, which includes planting of low growing, low maintenance evergreen and perennial ornamentals in the southeast corner of the gateway area, is also targeted for completion this spring. Funds for the cost of the planning, design, tree/plant purchase and installation were provided through a bequest to the Essex Foundation by the late Elizabeth “Diz” Barnes Callender and her predeceased sister Mary Frances Barnes. The Essex Foundation was founded in 1970 through an open-ended bequest to benefit the town. Board members are dedicated to making a difference in the lives of Essex citizens by providing medical, educational, social, welfare, cultural, recreational, and civic support. Thanks to the Foundation’s endowment, as well as the many donations received from individuals, businesses and other organizations, the Essex Foundation is able to provide “seed money” for new services and to allocate funds to fill needs not met by other organizations or sources. In general, funds are granted for special purposes, including buildings, equipment, land, and programs, but not to recurring expenses. More information can be found at www.theessexfoundaton.org. ESSEX/OLD LYME — Musical Masterworks and Community Music School (CMS) have announced a new scholarship to honor the memory of Nancy D. Thomas. Ms. Thomas also was on the staff of Musical Masterworks for almost 25 years. She was fastidious in her responsibilities working with the pianists onstage and was well loved by all. “Nancy was an indispensable part of Musical Masterworks. We are delighted to partner with her beloved Community Music School in establishing this scholarship in her name, so that more young people can discover the power of music in their lives. We believe this would have pleased Nancy immensely,” said Alden Rockwell Murphy, President of Musical Masterworks. Community Music School and Musical Masterworks are pleased to honor her memory with the Musical Masterworks Scholarship in Honor of Nancy D. Thomas, which will provide the tuition for a middle school student to take music lessons, 30 minutes each, for one full year at Community Music School. The scholarship will be awarded annually for the next five years. To be eligible, the candidate must be a student of classical voice or instrumental music and reside in Middlesex County or New London County. Interested students must complete an application and submit an audio recording of two pieces of classical music in contrasting styles as well as a written recommendation. A three-member jury comprised of representatives of both Community Music School and Masterworks will review applications. The application deadline for the scholarship is June 16, 2017, and the scholarship recipients will be notified mid-summer. To learn more and to obtain an application, contact Community Music School at (860) 767-0026. Editor’s Notes: Community Music School offers innovative music programming for infants through adults, building on a 34-year tradition of providing quality music instruction to residents of shoreline communities. CMS programs cultivate musical ability and creativity, and provide students with a thorough understanding of music so they can enjoy playing and listening for their entire lives. Learn more at www.community-music-school.org or call 860.767.0026. Musical Masterworks brings to Southern New England world-class chamber music performances and outreach programs which attract, entertain, and educate a diverse audience. 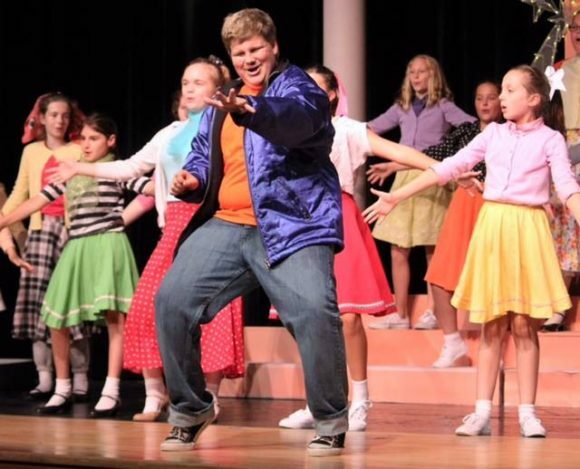 Now planning its 27th season, Musical Masterworks offers five weekends of performances from October through May in Old Lyme. Learn more by visiting www.musicalmasterworks.org or by calling 860.434.2252. Photo from Unsplash.com by Stefan Steinbauer. ESSEX – The Rockfall Foundation and the Connecticut River Museum present “Understanding Local Pollinators,” a free environmental forum on Thursday, May 11, at 5:30 p.m. at the Museum, 67 Main Street, Essex. 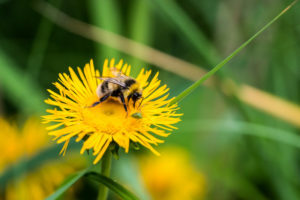 Speakers will address issues relating to pollinators and the plants they sustain in the Connecticut River valley, including natural environment, organic farming, and home gardening of flowers, vegetables and shrubs. Presenters include Judy Preston, Connecticut Sea Grant; Gail Reynolds, UCONN Extension Master Gardeners Program; Jeff Cordulack, Northeast Organic Farming Association of Connecticut; and Jane Seymour, CT Department of Energy and Environmental Protection. This free event is sponsored by the Rockfall Foundation and is part of its “Meet Your Greens” monthly networking series. Refreshments will be served and a reception continues on the Museum’s north deck following the presentations. Advanced registration is encouraged by calling the Connecticut River Museum at 860-767-8269. The Rockfall Foundation supports environmental education, conservation programs and planning initiatives in the Lower Connecticut River Valley. 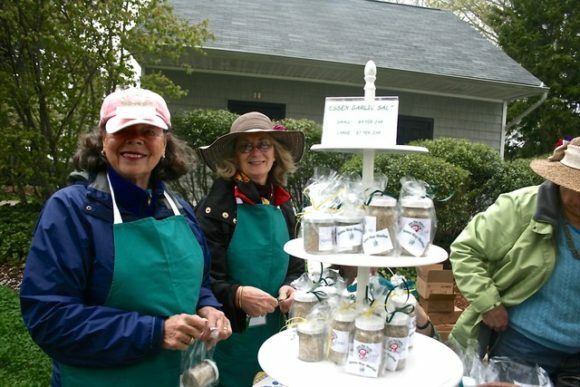 Established in 1935, it is one of Connecticut’s oldest environmental organizations and annually awards grants to non-profits, schools and municipalities. Meet Your Greens is an official program of Green Drinks International’s informal monthly gatherings that offer attendees a chance to network with other local people interested in environmental issues, and the means to solve them. The Connecticut River Museum’s mission is to lead in the study, preservation and celebration of the cultural and natural heritage of the Connecticut River and its valley. By deepening understanding of the River’s importance to past generations, the Museum inspires the stewardship of future generations. For additional information, contact the Rockfall Foundation at 860-347-0340 or visitwww.rockfallfoundation.org. AREAWIDE — State Rep. Robert Siegrist hailed the passage of a bill in the House of Representatives this week that looks to allow certain state pharmacies to accept and dispose of unused prescription drugs. Rep. Siegrist proposed a similar measure in the General Assembly in the beginning of the 2017 legislative session. Currently, prescription drug drop boxes in Connecticut are located in local police stations. The bill has the support of the Connecticut Association of Community Pharmacies. According to Governor Dannel Malloy, Connecticut saw an increase in the amount of unused prescription medications that residents dropped off at collection boxes during 2016, with the state collecting a total of 33,803 pounds worth of various medications throughout the year. That amounts to a 43 percent increase compared to the amount that residents dropped off in 2015, when 23,651 pounds of unused drugs were collected by the state. The final rule on the Responsible Drug Disposal Act of 2010 provided by the Drug Enforcement Administration (DEA) in September of 2014 expanded the authority of authorized hospitals/clinics and retail pharmacies to voluntarily maintain collection receptacles. These receptacles would still be subject to regulation and protections under the law. This bill will give pharmacies the option to participate as a collection site, not require it, and would likely help to get more prescription drugs off the street from people who would otherwise feel uncomfortable returning them to the police directly. Editor’s Note: Siegrist represents the 36th District communities of Chester, Deep River, Essex and Haddam. 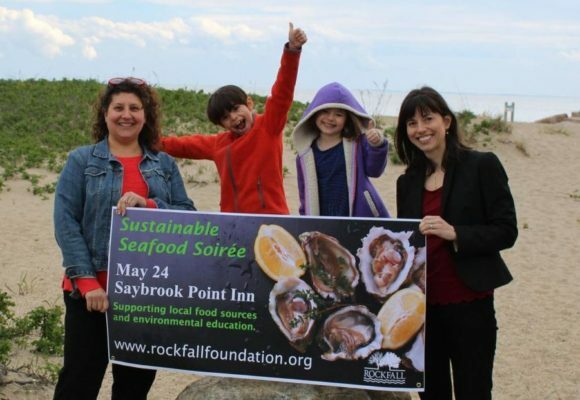 From left to right, Robin Andreoli, executive director of the Rockfall Foundation and Nat, Sariah, and Kate Novick of Killingworth look forward to the Sustainable Seafood Soiree on May 24 to benefit environmental education programs in the Lower Connecticut River Valley. AREAWIDE – The Rockfall Foundation and the Noank Aquaculture Cooperative present a “Sustainable Seafood Soiree” on Wednesday, May 24, to raise awareness of locally farmed oysters with proceeds to benefit the Foundation’s grants and environmental education programs. This unique event will take place at 5:30 p.m. at the beautiful and “Green Lodging Certified” Saybrook Point Inn, 2 Bridge Street, Old Saybrook. Steven Plant of Connecticut Cultured Oysters will speak about the Noank Aquaculture Cooperative’s efforts as responsible shellfish farmers. Member farmers focus on growing some of the finest oysters in the Northeast, including Mystic Oysters and Thimble Island Oysters. Attendees will enjoy an abundant oyster raw bar, hors d’oeuvres and beverages on the patio overlooking the majestic marina, surrounded by fresh salt air and breathtaking views. Proceeds will support environmental education programs of the Rockfall Foundation, including the “Greening Kids” grant program with the goal of nurturing future environmental stewards. The program funds environmental literacy activities offered in schools and by several non-profit organizations throughout the Lower Connecticut River Valley. The Rockfall Foundation is one of Connecticut’s oldest environmental organizations, founded in 1935 by Clarence S. Wadsworth, and is headquartered in Middletown. Tickets are $75 per person and advanced registration is encouraged by calling the Rockfall Foundation at 860-347-0340 or by visiting www.rockfallfoundation.org. The event is generously supported by Guilford Savings Bank and Attorney John Boccalatte and Dr. Michele Salonia. 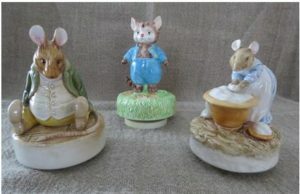 WESTBROOK — Westbrook Historical Society hosts its Arts and Craft Fair on Sunday, July 9, from 10 a.m. to 4 p.m.
For information, call 410 490 3223 or 860 399 6100. Families are invited to create hands-on crafts during Community Free Day on May 7, at the Florence Griswold Museum in Old Lyme. OLD LYME — The Florence Griswold Museum in Old Lyme presents its annual Community Free Day on Sunday, May 7 from 11 a.m. to 5 p.m. in Old Lyme. The event offers free admission to the Museum’s 13-acre campus, and includes family friendly activities and musicians Steve Elci and Friends at noon. Museum-goers visiting the original Florence Griswold House are treated to guides sharing stories of the Lyme Art Colony artists who stayed with Miss Florence in the boardinghouse over 100 years ago. The house, decorated as it was in 1910, includes the original paintings that artists created on the door and wall panels of the house. On view in the Museum’s Krieble Gallery are two animal-centric exhibitions. Matilda Browne: Idylls of Farm and Garden offers new research on this American artist who specialized in landscapes, gardens and animal portraits. Beasts & Best Friends: Animals of the Lyme Art Colony showcases works of farm and domestic animals. Free Day attendees can also visit the Chadwick Art Studio, presented as it would have looked in 1920, the Rafal Landscape Center, as well as the Museum’s gardens and grounds along the Lieutenant River. And the award-winning Café Flo will be open. Free Day highlights family enjoyment of the Florence Griswold Museum. Family friendly entertainment with Steve Elci and Friends begins at noon. 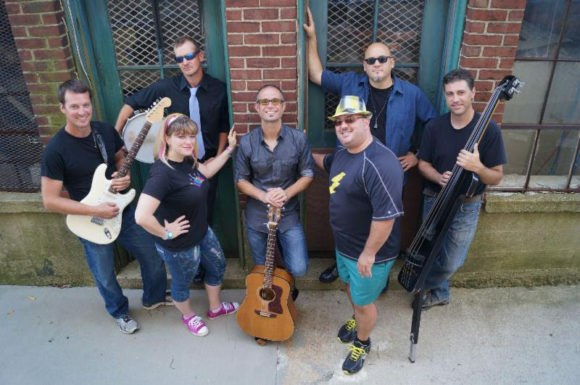 Steve Elci and Friends will entertain at the Museum on Sunday. Artists and adventurers of all ages can enjoy painting outside in the gardens and learning more about nature through a selection of Explorer Kits. All materials included. While at the Museum, families are encouraged to follow scavenger hunt cards in the Florence Griswold House, and uncover art details in the Krieble art gallery with “Can You Find Me” game cards. Be one of the first to pick up the newest keepsake publication, My Sticker Book Guide to the Florence Griswold Museum. The beautifully illustrated booklet tells the story of Miss Florence and her artist friends. Each time a child visits the Museum, they earn a sticker to complete one of the booklet illustrations. Those who collect all six stickers receive a gift. On May 7, Community Free Day visitors will hear about life in an artists’ boardinghouse at the Florence Griswold Museum in Old Lyme. A historic center for American art, the Florence Griswold Museum is considered the Home of American Impressionism. The Museum is located at 96 Lyme Street, Old Lyme, CT, exit 70 off I-95. For additional information contact the Museum at 860-434-5542 or www.FlorenceGriswoldMuseum.org. 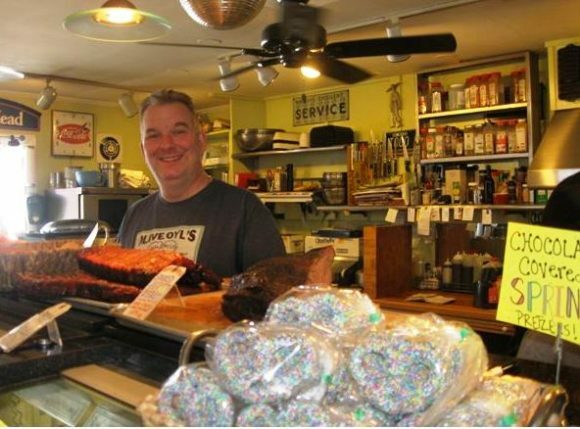 A cheerful Kevin Kendall, co-owner of Olive Oyl’s in Essex, stands at the counter in the current shop. ESSEX — Olive Oyl’s, a favorite sandwich shop in Essex, presently located at 77 Main Street, will be changing its address as early as this coming June, according to Kevin Kendall, who co-owns the shop with his wife Jennifer. The shop’s new location will be at 6 Main Street in Essex and the shop there will be considerably larger than the current one. A flag waves above the entrance to the current Olive Oyl’s shop at 77 Main Street in Essex. For several weeks, workmen at the new location have been modernizing the present structure and also resurfacing the paved driveway at the front of the store. Olive Oyl’s new home at 6 Main Street. Olive Oyl’s move to a new and much larger location in Essex up Main Street can be seen as a clear plus for the town of Essex. It will likely draw more visitors to that section of town though passengers arriving in Essex by boat will have a little further to walk up Main Street to make their purchases … but the delicious offerings at their destination will surely be worth the effort! Hikes are fun for all ages. 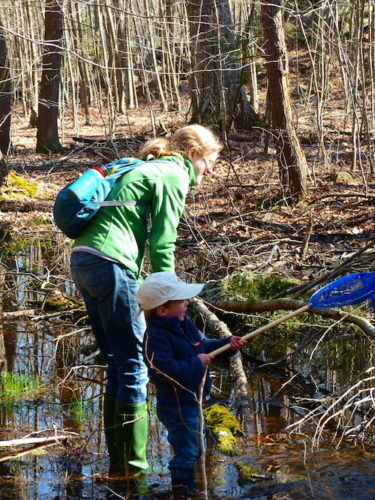 ESSEX — Essex Land Trust is hosting a hike in The Preserve’s Vernal Pools on Saturday, May 6, starting at 9 a.m.
Join ecologist and Ivoryton resident Bob Russo on a hike in The Preserve in search of salamanders, frogs, and plants emerging from the long winter. He will guide hikers to a few of The Preserve’s vernal pools and describe the biological and geological features that make these areas so unique and bountiful. Russo is a soil scientist, wetland scientist and ecologist, who frequently played in swamps while growing up. 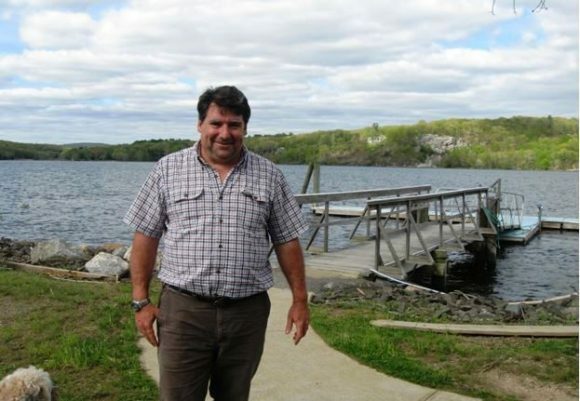 He works for a small engineering company in Eastern Connecticut, lives in Ivoryton and is also chair of the Essex Park and Recreation Commission. Meet at The Preserve’s East Entrance parking lot on Ingham Hill Rd., Essex. The hike will last one and a half hours. The terrain is easy to moderate. Bring boots. Open to all ages. Bad weather cancels. For further information, contactJim Denham at jgdenham@gmail.com or 860-876-0306. 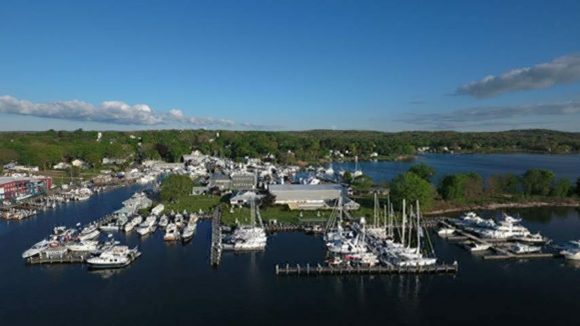 Aerial view of the Brewer Essex Island Marina where the Connecticut Spring Boat Show will be held. ESSEX – The Connecticut Spring Boat Show has announced the 2nd Annual 2017 in-water show dates of May 5-7, at Brewer Essex Island Marina located in Essex, Conn. The boating industry has come together to unveil some of the latest innovations in boating, offer purchase incentives and give consumers an ideal opportunity to compare different boats, dealers and options in one convenient location. Interested boat buyers will enjoy select opportunities for sea trials throughout the weekend; thus giving prospective buyers a unique ‘try-before-you-buy’ experience. More than 3000 people are expected to attend the free show, rain or shine. Visitors attending the boat show will enjoy seeing a wide range of new and brokerage, power and sail models of all sizes, 10ft to larger than 60ft including family cruisers, performance boats, downeast trawlers, day sailers, picnic, center consoles, runabouts, pontoon and inflatables. Boat lines from American Tug, Beneteau, Bennington, Catalina, Chris Craft, Comitti, Cutwater, Defever, Dufour, Eastbay, Elan, Ferretti, Fortier, Grand Banks, Hinckley, Hunt, Legacy, Nordic Tug, Novatec, Ocean Alexander, Post, Rosborough, Rossiter, Sabre, San Juan, Sea Ray, Southport, Tiara, True North, Velasco, Windy, X-Yachts, and more will be represented. In addition to boats on the docks, the show will have SUPs and kayaks, gear, accessories and service companies on site from Action Sports, Boaters Buddy, Boatique USA, Boat Name Gear, Brewer Essex Island Marina, CermaLube, Coolermate Insert, Freedom Boat Club, LeafFilter, NMI-Permateek, Pantaenuis America, Connecticut River Museum, Sails UP for Cancer, US Coast Guard Auxiliary, WindCheck Magazine and more to be announced soon. Brewer Essex Island Marina is located on a 13-acre private Island, accompanied by a complementary ferry service, and offers 125 slips accommodating vessels up to 200’. The resort marina is family friendly and the popular Marley’s Café will be open for the weekend offering food and beverages with a portion of sales proceeds to be donated to Sails Up 4 Cancer. In addition to the general event, a lively ‘Cinco de Mayo’ celebration is planned for May 5, from 5 to 7 p.m. and will feature live Caribbean music and fare. Historical Downtown Essex is located on the Connecticut River, a few short miles from Long Island Sound. The small waterfront town is a boating, sailing and tourist destination featuring quaint shops, markets, and restaurants. The show is a production of WindCheck Magazine and is sponsored by Brewer Essex Island Marina, Essex Boat Works, Yacht Brokers Association of America (YBAA) and YachtWorld. Visit www.ctspringboatshow.com for specific event details. Contact Anne Hannan of WindCheck Magazine at anne@windcheckmagazine.com for dealer and vendor application information. The Katharine Hepburn Cultural Arts Center, “the Kate”, welcomes back Eastern Connecticut Ballet for two performances in one featuring Ballerina Swan and Carnival of the Animals. A total of four family-friendly performances will be held this Saturday, May 6, at 11 a.m. and 2 p.m., as well as Sunday, May 7, at 1 and 4 p.m.
Ballerina Swan is based on a new book by New York City Ballet’s Allegra Kent and is choreographed by Gloria Gorvrin, the Artistic Director of Eastern Connecticut Ballet. Laugh and cry as Sophie the swan follows her dream leaving the safety of her home on the water to experience humorous escapades in the ballet classroom. 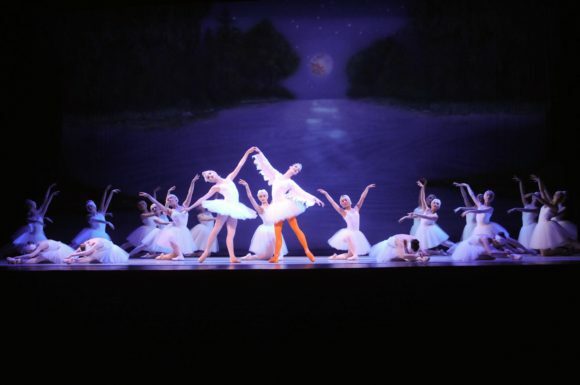 The ballet concludes with breathtaking variations from Tchaikovsky’s Swan Lake. Complete the unique double-bill family event with Carnival of the Animals. Lions, birds, and fish will frolic on stage in Camile Saint-Saen’s musical masterpiece. This promises to be an afternoon of beautiful music and dance. For more information on tickets for any shows at the Kate, visit www.thekate.org or call the Kate Box Office at 860-510-0453. 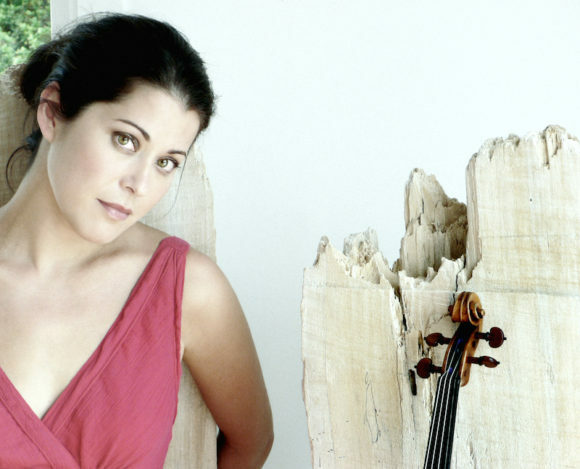 Violinist and two-time GRAMMY nominee Jennifer Frautschi, who plays in Musical Masterworks upcoming concerts. AREAWIDE — Musical Masterworks will close their 26th season with a dramatic program of Russian works culminating in Tchaikovsky’s towering Piano Trio. Pianist Andrew Armstrong, with both passionate expression and exceptional technique, along with violinist and two-time GRAMMY nominee Jennifer Frautschi, will join Edward Arron for a memorable performance. The May performances are Saturday, May 6, at 5 p.m. and Sunday, May 7 at 3 p.m. at The First Congregational Church of Old Lyme, which is an acoustically rich and beautiful venue for chamber music. To purchase tickets ($35 individual; $5 student), visit Musical Masterworks at www.musicalmasterworks.org or call 860.434.2252. Jewelry will be on sale during May Daze at Dina Varano. CHESTER – The 26th annual May Daze celebration is First Friday, May 5 when all the shops, restaurants and galleries in town are open late with live music, art events, special deals, Mexican cake, Argentinian sparkling wine, local beer tastings and new lines of artisan jewelry. This year, because May Daze falls on Cinco de Mayo, a number of businesses are adopting a Mexican flavor for the evening. Strut your Mutt is staging “Connecticut Shelter Dogs Celebrating Cinco de Mayo” when rescue dogs will be up for adoption and margaritas and chips and salsa will be served. 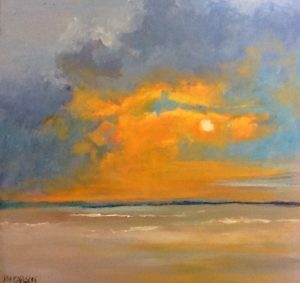 ‘Warmth’ by Pam Carlson of Essex at Maple & Main Gallery. 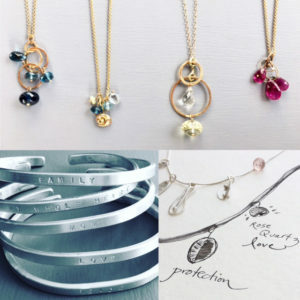 A Mother’s Day collection of new Leiva jewelry featuring parings of mother/daughter necklaces and earrings, will be unveiled at Lori Warner’s and sangria and sweets will be offered. In the Swoon Boutique downstairs, it’s 10 percent off all Mother’s Day gifts. At Maple and Main Gallery, “Little Gems”, a show of paintings, all 8”x 8,” all $200 and all newly created by the gallery artists, will open in the Stone Gallery where wine and Mexican dip and chips will be served. Mini margaritas will be offered at The French Hen which is launching a new jewelry line by T. Jazelle, created on Cape Cod and perfect for Mother’s Day and graduation. Dina Varano is offering unique jewelry for mom as well as unveiling new spring arrivals. In another nod to Cinco de Mayo, ginger/lime spritzers with be offered with chips & guacamole. And, at the Perfect Pear, a festive piñata cake will be served and 10 percent off is being offered on a special selection of Cinco de Mayo-related merchandise. To herald in spring, The Pattaconk’s ice cream shop will open for the season on May Daze and live music will be performed on the patio from 7 to 10 p.m. while Arrowhead will be playing at Leif Nilsson’s Studio and Gallery . And for the younger crowd, Circle of Friends Montessori is hosting a May Daze open house from 5 to 7 p.m. featuring music, face painting, art projects and a planting activity with Cold Spring Farm. C&G is celebrating its 10th anniversary with 10 percent off everything in the store. Argentinian sparkling wine will offered. A wine tasting by Sunset Hill Vineyards in Lyme will take place at BlackKate Leather and at Chester Package Store there will be a tasting of local beers from 5 to 7 p.m.
At Lark, MaryAnne Delorenzo of Beach House Stained Glass and Jewelry will be featured and wine and appetizers will be served. At Elle, everything will be 50 percent off in anticipation of a month-long closing in May for renovations and rebranding. A grand re-opening will be on the first Friday in June. Come back to town Saturday, May 6 when the students in Rayna’s Dance Studio will perform selected numbers from their upcoming recital, “Love and Dance” at noon in the downtown. 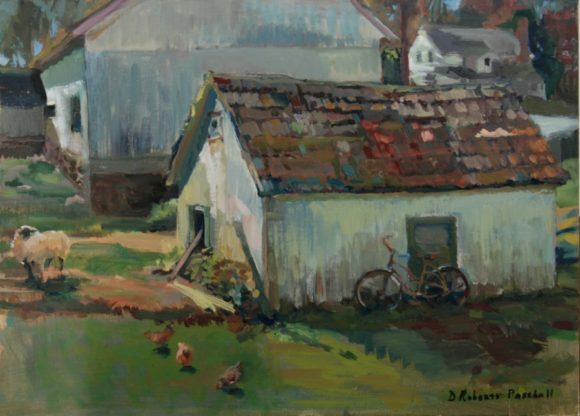 Old Wooden Roof by Diana Roberts-Paschall, oil, 12 x 16. 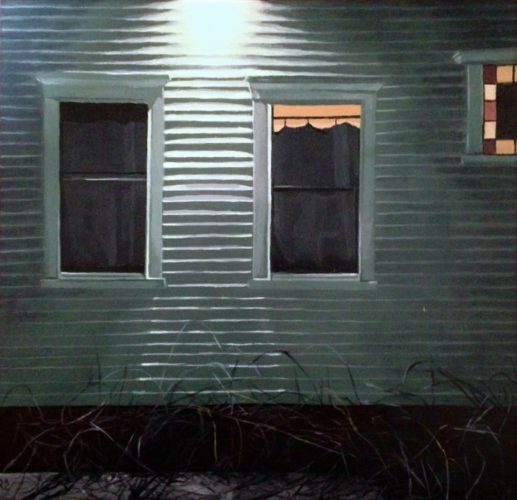 ESSEX — The Essex Art Association (EAA) opens its 2017 exhibit season with a juried show “Anything You Want.” This exhibition encourages artists to display works that show what they are passionate about, art that speaks to their creativity and that inspires their voice. The exhibit’s opening reception is Friday, May 5, from 6 to 8 p.m. The show runs May 6 – 27. 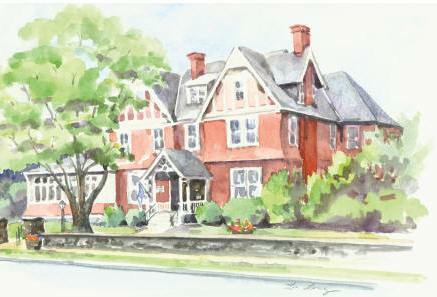 The EAA Gallery is located at 10 North Main Street, Essex, CT. Gallery hours: 1-5 pm daily, closed Tuesdays. For more information visit essexartassociation.com or call 860-767-8996. $1,800 will be awarded to exhibiting artists for their work in various media, plus one EAA artist will be given a solo exhibit in our Exit Gallery during our 2018 gallery season. On Thursday we joined our Republican colleagues to unveil “Confident Connecticut”, a no-tax-increase solution for the upcoming biennium. In undertaking this difficult task we have proposed true solutions for the budget and are poised to lead Connecticut back to financial stability. The Republican proposal concentrates on funding the core functions of government while keeping spending in check. 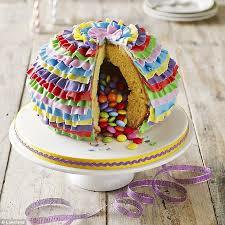 It calls for a strict spending cap and a limit on the amount of bonding that can be allocated. Our proposal restores funding for Fire Training schools, ensuring that firefighters across the state are properly trained to best respond in an emergency situation. Additionally, we provide for Connecticut’s senior population by preserving funding for Meals on Wheels. Further, municipal aid is fully maintained, and in some cases increased. It is unmistakable that an undue financial burden has been placed on our cities and towns, which has restricted local budgets. Long-term structural changes must be made to the way the legislature goes about the budgeting process to help our municipalities. Consequently, our proposal requires the state to provide municipalities with projected aid by March 1. This will be a critical tool for creating municipal budgets. Education represents a large portion of the budget, which is why a more equitable formula was used to disperse education dollars. The Republican proposal accepts the responsibility of our teachers’ pensions, saving municipalities from the governor’s proposal that would have levied $400 million from them to fund that account. It is also important to note that Middlesex Hospital and other hospitals across the state are held harmless from further tax increases in our proposal. There are painful cuts in our proposal which were difficult to make. As state revenues continue to change we also recognize that some revisions to our proposal will be needed. However, we are ready to work with our colleagues at the Capitol to generate the best budget possible to instill confidence that our residents, business and municipalities deserve. Osprey in flight. Photo by Brock Graham. AREAWIDE — The Connecticut Audubon Society’s Roger Tory Peterson Estuary Center is offering a new program of Saturday morning field trips to natural areas along the lower Connecticut River starting May 6. Estuary Explorations will be led by PhD ecologist Paul Spitzer, a protégé of internationally recognized naturalist and painter, Roger Tory Peterson. Each exploration will run from 9 a.m. to 1 p.m., with the possibility of extending the field tripinto the afternoon, depending on the participants’ interest. The fee for each field trip is $30 per person ($25 per student) and registration is required. To register, visit this link. Estuary Explorations will give participants a chance to learn about the Lower Connecticut River Estuary’s ecosystems and wildlife as the year progresses from the peak bird migratory season of May, through high summer, and into the late fall. Paul Spitzer. Photo courtesy of Paul Spitzer. Spitzer has designed the programs to follow in the footsteps of one of the 20th century’s most famous naturalists, field guide author and illustrator Roger Tory Peterson, who spent his adult life painting in his studio in Old Lyme and examining the flora and fauna of the Connecticut River Estuary and the world. Spitzer will showcase some of Peterson’s favorite natural sites and share his extensive knowledge of the ecology of the region. Spitzer plans to lead these explorations at a “Thoreauvian saunter,” moving slowly to appreciate many of the birds, plants, and insects that Peterson once enjoyed. While Old Lyme tends to be recognized for its scenic views and historic artist colony and arts culture, it is also situated at an important ecological hub in New England — the meeting of the waters. In this species-rich estuary, the fresh water of the vast Connecticut River and Long Island Sound mix, resulting in a wealth of natural life. Spitzer learned his natural history while growing up in the Connecticut River Valley. He is a graduate of Old Lyme High School and continued up the river to attend Wesleyan University. He later earned his PhD in ecological sciences from Cornell University. 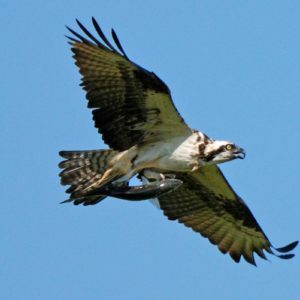 More recently, he has studied the now substantial Connecticut River Estuary Osprey colony as a “biomonitor” of migratory menhaden abundance, the Osprey’s preferred food source. Spitzer advocates for sustainable management practices of this keystone fish for its ecosystem, economic, and societal functions. Working alongside Spitzer will be Old Saybrook native, Jim Arrigoni. Arrigoni has worked as a fisheries biologist in Washington State and developed protocols to evaluate stream water quality in Hong Kong. Most recently, he has taught cultural and aquatic ecology classes at Goodwin College, and he is currently completing a PhD on the conservation value of restored wetlands. Spitzer has studied Ospreys for 50 years, his research beginning here in the Connecticut River Estuary. By the 1970’s, the impact of DDT in the ecosystem whittled the local Osprey colony down to one active nest. Spitzer was instrumental in the recovery of this important keystone species to these waters. After meeting at the Old Lyme I-95 Park and Ride (Exit 70), participants will enjoy three hours of ecological exploration followed by a brown bag lunch and guided discussion in the field. Spitzer is also willing to offer optional afternoon sessions gauged by the stamina and interest of the participants. Beyond the four Saturdays in May, the field trips will occur monthly through November.